Introducing the new couch– the most exciting item to pass through our door since two weeks ago when we got a salad spinner. And so clearly things have been a bit dull around here domestically, but it’s all looking up now. The essays are marked and ready to be sent away, and the sun is shining for the first time in weeks. The weather forecast for the weekend is promising. Now reading Open by Lisa Moore, and each story seems like a package wrapped up just for me. And of course, there’s the couch. Reclining has never been so much fun. What a lovely couch! A good place to curl up, watch TV, read a book…oh, I am so jealous. I wish I had a room even to put a new couch! WOW! 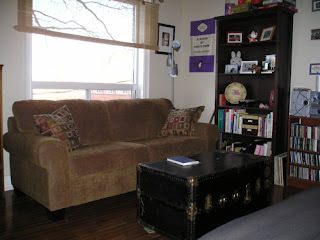 The couch, and new coffee table are gorgeous. I can’t wait to see them in person. Does this mean you are really grownups? Erin: we’re totally not grownups. Don’t be ridiculous. Unless grownup means being over futons. We are. Please do come over and sit on the couch though. I am thinking of having a party. D: But you have a house! And one day you’ll be able to stuff it full of couches. I must admit the picture of your hole in the floor concerned me as “fixer-upper” is the only kind of house we will ever be able to to buy, but neither of has the fixing up skills your RRHB appears to possess. Perhaps we will have to learn to live with holes in floors? But enough about the couch. I am going out to read on my porch!